Poonch, March 21: Deployed in the most porous borders to safeguard the country and the people of India from foreign threats, the Indian Army soldiers had their day of enjoyment and relaxation on the festive occasion of Holi. 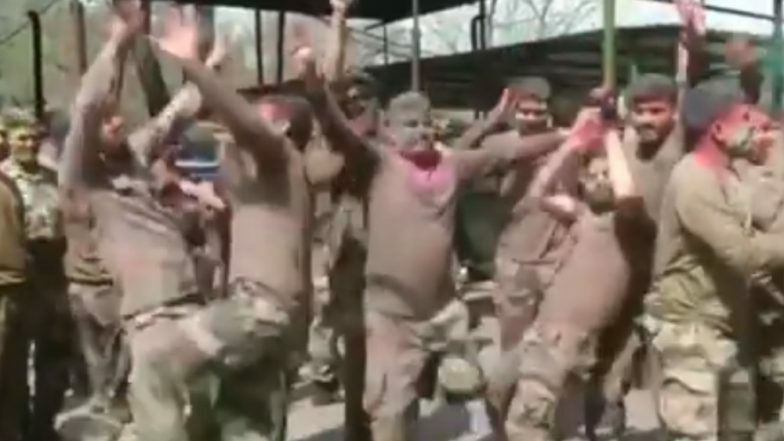 The Indian Army personnel on Thursday played Holi with their colleagues in a celebratory mood in Poonch district of Jammu and Kashmir. With colourful gulals being flown in the air, music beats providing the energy and Army personnel dancing to the tunes, the scene was worth watching for. Each of the soldiers was seen happy playing the festival of colours. , and soon it went viral. Holi 2019: Ayodhya Case Litigants Mohammad Iqbal Ansari, Mahant Dharamdas Play Holi in Temple Town. Holi is one of the most-awaited Hindu festivals of India. With the onset of spring, here we arrive on the main day of the festivity- Rangwali Holi. It’s called the ‘Festival of colours’ since it’s celebrated by smearing gulaal or coloured powder on each other. Holi is celebrated with a lot of pomp in the northern states of India on the full moon day (Purnima) of the Falgun month for two days. As per the Hindu calendar, Holi 2019 began on March 20 and stay for another day till March 21. The day symbolises the victory of good over evil and is celebrated mainly to mark the beginning of spring season.